At the Convocation Center on Oct. 12 and 14, the Roadrunner volleyball team took on Florida International University (FIU) and Florida Atlantic University (FAU). 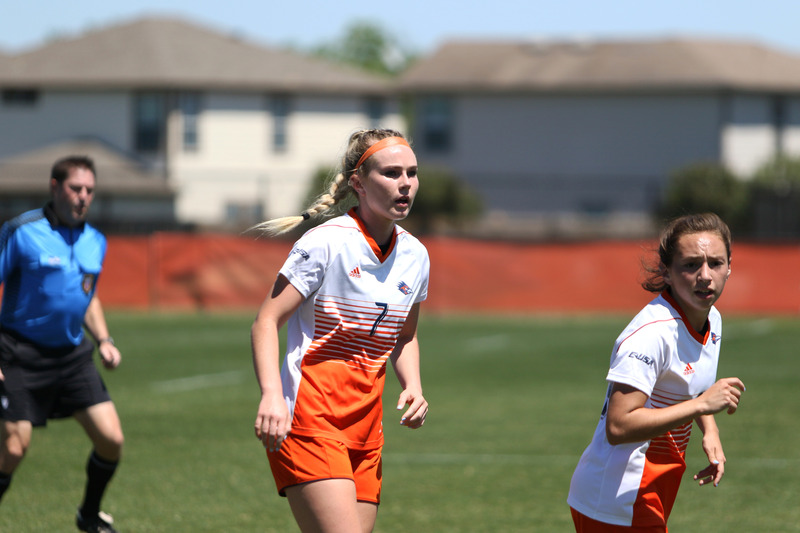 Both teams were amongst the top five teams in the conference, but the Roadrunners were unfazed coming into the games and embraced the competition. Friday’s game was during “Best Fest,” so some students were able to enjoy the festival as well as get their school pride in seeing the volleyball team showcase how good they truly are in this sweep of conference games. 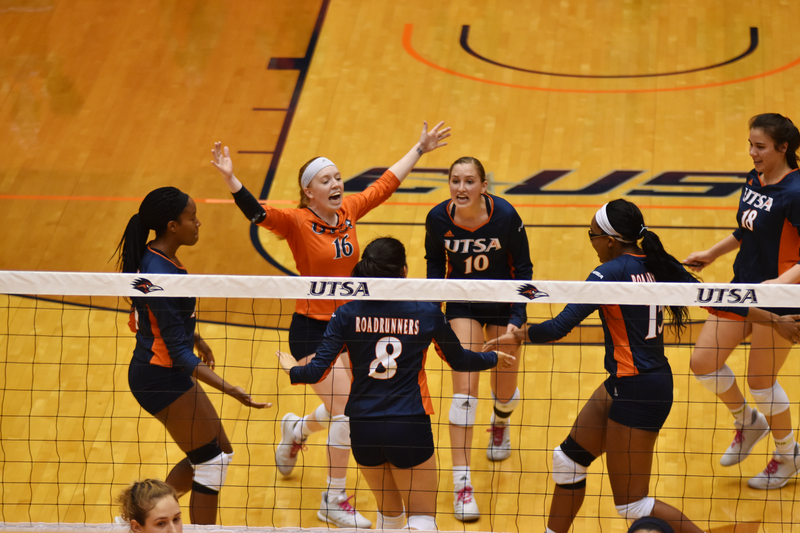 After winning the second set along with sneaking a win in a very tight third set, UTSA dropped the fourth set 25-22, but the Roadrunners kept their heads up high and were unapologetic with their offensive attack. Even with an emotional roller coaster taken into five sets, the Roadrunners were able to take over in the final set and win off of a kill by Brianna McCulloch. She finished with seven for the night. The final was 3-2, ‘Runners. Amanda Gonzalez was the team leader in assists against FIU, racking up 37. Gonzalez assisted teammates like Hannah Lopez with 16 kills, Kirby Smith with 14 kills, Kara Teal with 11 kills and Montse Castro with 10 kills, all of which led UTSA’s powerhouse of an offense. The team had a scoring percentage of 40.9 percent. But let’s not forget about their defensive ability too, with a total of 12.0 team blocks and 88 digs. Forty-two of which came from Gonzales and Shelby Williams, 21 each. With a fresh win against one of the better teams in Conference USA, the Roadrunners were ready for another good C-USA team in FAU. The Owls were 5-1 in the conference coming into the game and tied with UTSA. The Roadrunners were definitely aiming to keep the hot hand as well as home-field advantage coming into this game. They were able to stay on fire, winning their game with a final of 3-1. All of the sets were very competitive, each ending by a two or three point deficit. 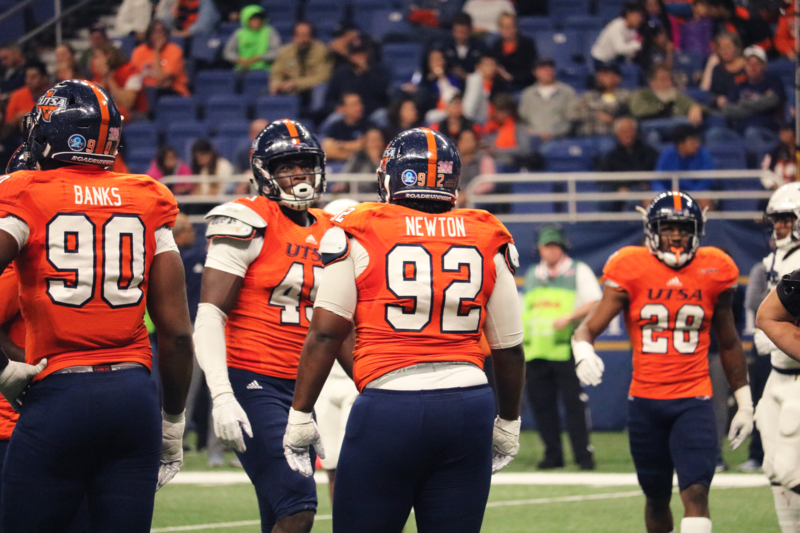 UTSA had a total of five-team blocks this time around, and the FAU offense was filled with some great players, but UTSA was able to stay atop the adversity and keep their eye on the prize. Each team only had 20 errors, battling much of their entire time they were on the court. Hannah Froeschl, with a hitting percentage of 51.9 percent and 18 kills, held the team-high in both categories. Gonzalez and Mia Perales each put up huge assist numbers, bringing in 33 and 22, respectively. Shelby Williams had 20 digs and helped lead the defense as they tallied five total blocks. On Monday, Froeschl was named C-USA Offensive Player of the Week along with teammates Gonzales, the C-USA Setter of the Week, and Lopez, C-USA Freshman of the Week. In the middle of the C-USA stretch, the Roadrunners only have seven more games in their regular season. The Roadrunners are definitely looking to sneak in and grab the number one seed as they get closer to the C-USA tournament. Over these next few weeks, it will be exciting to see how the UTSA Roadrunners can finish off their season and see how they finish in the C-USA tournament in West Virginia. McCulloch getting up high to hit a ball.